June 22, 1941, a date that would likely change the fate and political landscape of Europe forever. Nearly 4 million Axis soldiers, comprising of armies from Germany, Italy, and Romania violated the precarious nonaggression pact between Germany and the Soviet Union by launching a full invasion of the latter. Finland and Hungary would join suite in the follow weeks. Operation Barborrossa would entail one of the largest invasion forces in human history. Battlefields such as Stalingrad, Leningrad, Moscow, Sevastopol, and Kursk would become synomynous of the gore, devastation, and suffering of the Eastern Front.. In this campaign, you will get the choice of serving as a German soldier in the Ostfront, attempting to defy Napoleon's legacy, or as a Red Army soldier, fighting a crucible of national survival in the Great Patriotic War. A continuing legacy for Forgotten Hope 1. A historical virtual simulation of the first 2 years of the Eastern Front of WW2 including combined arms operations between infantry, artillery, tanks, planes, and boats and more. Change history by taking Stalingrad, or by holding the Fascists at the Russian frontier. Over 13 grueling battles throughout the western Soviet Union, from the marshes of Belarus to the Volga, from Leningrad to Rostov. 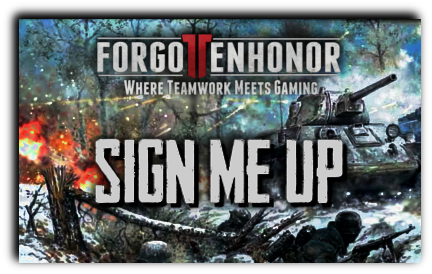 Played entirely on the highly acclaimed Forgotten Hope 1: Forgotten Honor minimod, which exclusively features maps designed for large-scale tournament play. .
Click in the image below to signup!